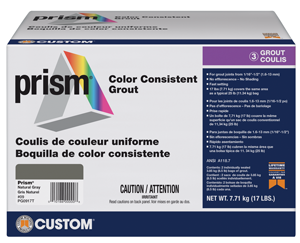 With its unique formula, Prism® sets a new standard in cement-based grout technology. Prism offers consistent color with no shading regardless of tile type, temperature or humidity. And it will not effloresce. Prism’s dense joints provide more resistance to stains than standard cement grouts and cures quickly developing high early strength. Formulated with CustomLite™ Technology, Prism is 32% lighter than other grouts, providing excellent handling characteristics and a smooth, creamy texture that accommodates grout joints as narrow as 1/16" (1.6 mm). A 17 lb. (7.71 kg) bag covers the same area as a 25 lb. (11.34 kg) bag of traditional grout. Polymer-modified – mix with water for any tile or stone installation. Meets ANSI A118.7 specifications.